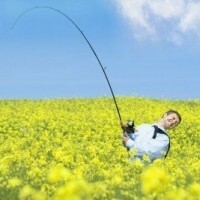 While Fishing for Sales, Do you fish where the fish are or do you cast your selling net everywhere? YOUR Selling range is the area where your target customer is located. It is how far away from your business base of operation you will travel to deliver your product or your service. Or, it is how far away your customer will travel to your place of business. We all know that the yellow pages are dead and internet search is the most common way your customers find you. To optimize your search find-ability, you must consider your selling range. YOUR selling range should be considered when you make your marketing investment (time and money). Determine which type of product or service you are marketing. Type #1: If you are selling a service or product where it is not necessary for the customer to meet you at a set location, and it is not necessary for you to provide your service on location, it is conceivable that the world is your range. Therefore, concentrate your online advertising and marketing efforts with organic search engine results and solution based keyword placements. Type #2: If you provide a service that is limited by your staff or you being on the site of your customer (home or business), then your range is defined by a practical geographical range that you are willing to service. Therefore, put your time and energy into local search engine results and geographic based keyword placements and category listings. Stuart Draper posted a nice description in an article about Knowing Your Range and Advertising Where The Fish Are. You can read this opinion at his Get Found First website blog. I do not know Stuart and cannot comment on his business, but IMHO this article is right on. He quotes Mary Bowling of clickz.com for the content of the article but I could not find the original. You can listen to an interview that I conducted on BizChatz Radio with Richard Geasey, co-author of Get Found Now, the book where I learned all about Google Local Business Center. And, I can comment on his business because I have applied his advice and it works. This entry was posted in Marketing and Advertising, Sales Essentials, Selling and tagged fishing, prospecting, sales, sell, Selling, target-market. Bookmark the permalink. 3 Responses to What’s YOUR Selling Range? What theme do you use on this blog? Just curious. I shall be very pleased to become a regular! The theme I use is Arthemia and a link is provided at the bottom of the page.